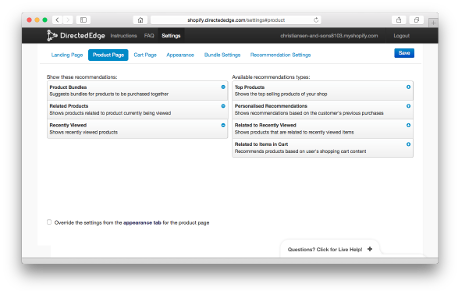 Check out our screenshots to see how easy it is to configure Directed Edge recommendations for your shop. You simply drag the type of recommendations you'd like to see on your product, cart and landing pages into the active set and save and boom the recommdations will appear on that page on your site. Easy to use graphical interface to decide how you want the recommendations to look on your site. You can choose the image size, orientation, text, colors, borders and more in our easy to use settings panel. Raw power full Liquid customization which lets you customize the apps appearance any way that you'd like, using the same type of templates you use on the rest of your site.